Vesna’s Fall is a Dance Work created by Lindsey Drury (drearysomebody) and No Collective (You Nakai, Kay Festa, Jay Barnacle, Earle Lipski, Ai Chinen, et al.) Performed by Lindsey Drury, Paige Fredlund, Kaia Gilje, Molly Schaffner, and You Nakai. With Laura Bartczak and Katelyn Hales. It is always difficult to know the dancer from the dance. By physically separating the two, Vesna’s Fall seeks to reinvent the problem. Each dancer wears a 14-foot movable curtained room that isolates her, extends her body, amplifies her movement, and blocks her view. Unable to see one another, the dancers attempt to coordinate the work in the ways that they are able, starting with their voices. Each audience member can choose what to see and from where. But watching one dancer always precludes seeing everybody and everything else. In this way, the work seeks to reveal the underlying condition of bodies that cuts across the division between performers and viewers, impeding them both from seeing the whole. In this workshop, we will explore how to divide one’s attention, and one’s embodiment, into multiple divergent tasks at once, in essence, to sacrifice one’s singular body to multiple simultaneous (and incongruous) embodiments using the sacrificial dance from Nijinsky’s Rite of Spring and a whole lot of crazy count structures. 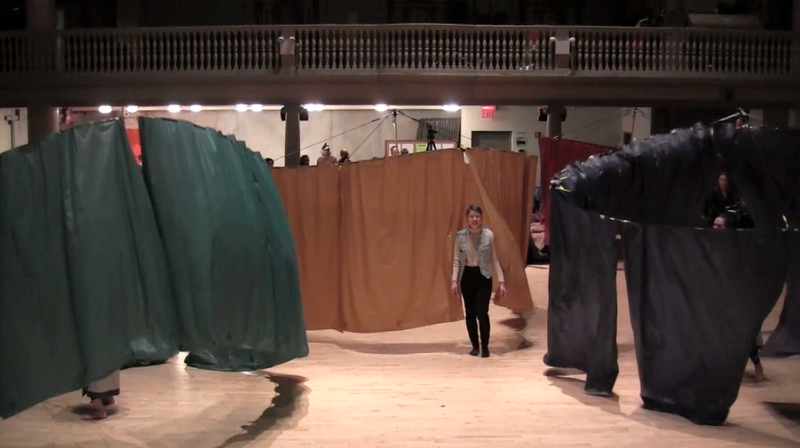 And yes, workshop participants will get a chance to try out dancing while wearing the giant contraptions from the piece. Lindsey Drury (drearysomebody) is a dance artist and body studies scholar originally from Seattle. She has been living and working in New York City since 2008 and presenting her work internationally. Her recent major artistic projects include Run Little Girl (2011), the last evening length work presented at the Cunningham Studio, Any Size Mirror is a Dictator (2012-2014), a durational dance opera in collaboration with Panoply Lab presented over 7 weeks at Momenta Art, the work House Music, in collaboration with No Collective, performed by mechanical and live dancers (will be presented next at the University of the Arts in Helsinki), and the solo project Aftermath (developed as a part of a Cora Dance Residency), which employs the time-based difference between embodied action and linguistic instruction to extend an act performed within 10 seconds to a dance performed within 10 minutes. Within the academic setting, she has worked with students as a teacher, guest artist, and commissioned choreographer at the American Dance Festival, Universidad de las Americas, Western Washington University, University of Utah, and the University of New Mexico. Drury burgeoned the feminist performance group No Wave Performance Task Force as a part of her residency at Gibney Dance Center 2012, curated a series called Post-Dance for the Brooklyn International Performance Art Festival (2013), and produced Argentine composer Ellen C. Covito’s Percussions/Repercussions at The Woods Cooperative. No Collective (You Nakai, Kay Festa, Earle Lipski, Jay Barnacle, Ai Chinen, et al.) makes various works that examine and (re)construct different modes of temporalities. Most often, these have resulted in music performances that explore and problematize both the conceptual and material infrastructures of music and performance. Other formats of work include play-scripts, picture books, haunted houses, and performance art. No Collective has been featured in Leonardo Music Journal (MIT Press, 2014) as one of the musicians doing interesting things with technology. Since its inception circa 2007, members of No Collective have varied both in quantity (from one to fifty) and quality (from reluctant music novices to professional instrumentalists) according to each works’ objective and situational conditions. Recent works include House Music C: Two Stories (Berlin, 2014), a collaboration with choreographer Lindsey Drury using handmade dancers who move on their own, and Concertos No.4 (National Museum of Modern Art Tokyo, 2012), where professional blind athletes played soccer with ball-shaped loudspeakers in a completely darkened 16,000 square feet performance space filled with 300 audience members. Curatorial projects include concerts of the Argentinian composer Ellen C. Covito in New York city, Tokyo, and Berlin; and publications include Concertos (Ugly Duckling Presse, 2011), a book which describes and prescribes the process of preparation, performance, and documentation of a music concert in the form of a playscript, and Sonnet for Concertos No.4 (National Museum of Modern Art Tokyo, 2013), a score of a nursery rhyme whose lyrics are the entire instructions for making another serious music concert. A brief portrayal of No Collective’s activities can be found in an interview with You Nakai by Elizabeth Hoffman, published in Perspectives of New Music (Winter, 2013). No Collective also runs an independent publisher Already Not Yet, which has released Ellen C. Covito: Works After Weather (2014), the first comprehensive catalogue of the maverick Argentinian composer.